1935 Rolls Royce wedding car in Black and Cream with a beautiful, comfortable and spacious interior. 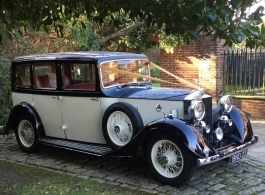 This stunning vintage Rolls Royce is available for wedding hire in Portsmouth and surrounding local areas and is an amazing car to have on your wedding day. The Claret leather seating is a great contrast to a traditional White wedding dress and up to 5 passengers can be seated in the rear with the use of the 2 fold away seats, if it is just the bride and her father and then bride and groom travelling there is lots of legroom and space for the largest of wedding gowns.